Results from the Fall 2017 Nielsen Audio ratings continue to be released by the Radio Research Consortium (RRC). System observers are watching the performance of full-time NPR News/Talk stations to see how the audience size compares to Fall 2016. Many stations set record ratings highs during the election season in 2016. Our first two markets, Madison and Burlington, show both advances and declines. 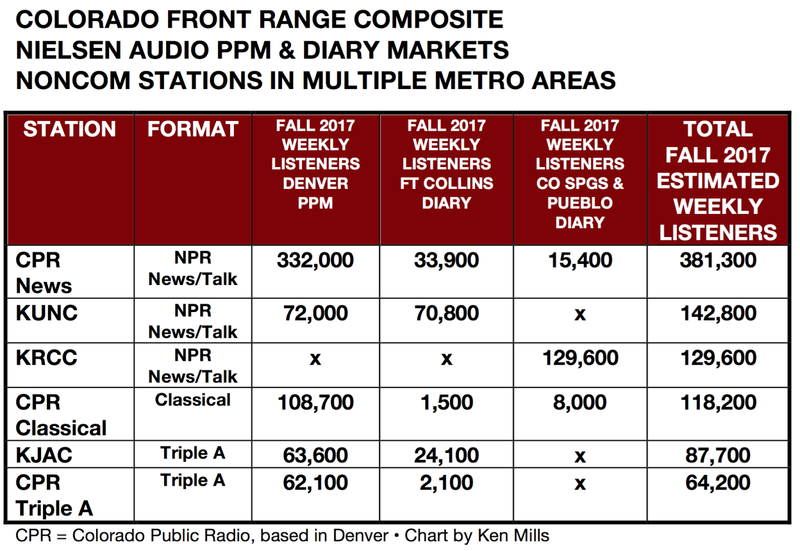 Both cities are considered excellent public radio news markets, so what is the reason for the difference in audience sizes? There is no 24/7 News/Talk noncom station in Madison. WERN has been Wisconsin Public Radio’s (WPR) dual-format station for as long as I can remember. It is no secret that news hounds want a full-time NPR News station and Classical fans want 24/7 music. Without more detailed information it is impossible to tell if the decline of estimated weekly listeners is because of news hours or music hours. Folks have urged WPR many years to move all of the news programming to WHA-AM and it’s network of FM repeaters and let WERN be all Classical. WPR hasn't resisted the change for various reasons. For instance, WHA already has lots of listeners to their unique public radio talk format. Somehow, WPR must create separate News/Talk and Classical stations pronto because now NPR News/Talk is not reaching it's full potential. Vermont Public Radio (VPR) has already made that decision. 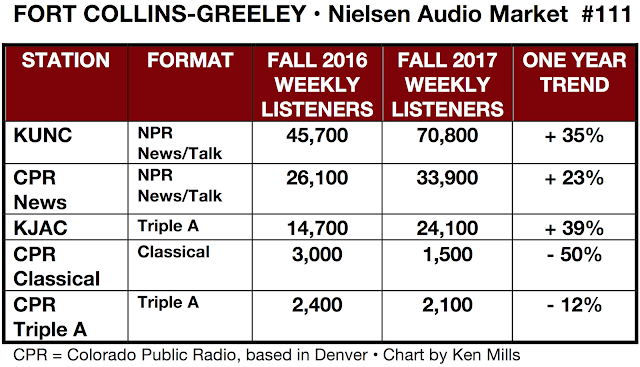 They moved the NPR News and Classical formats to separate stations over a decade ago and listeners have responded very positively. 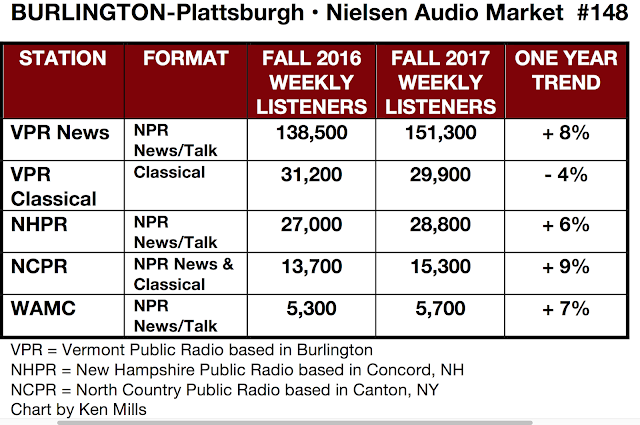 VPR News had 8% more estimated weekly listeners in Burlington in Fall 2017 than they did in Fall 2016. 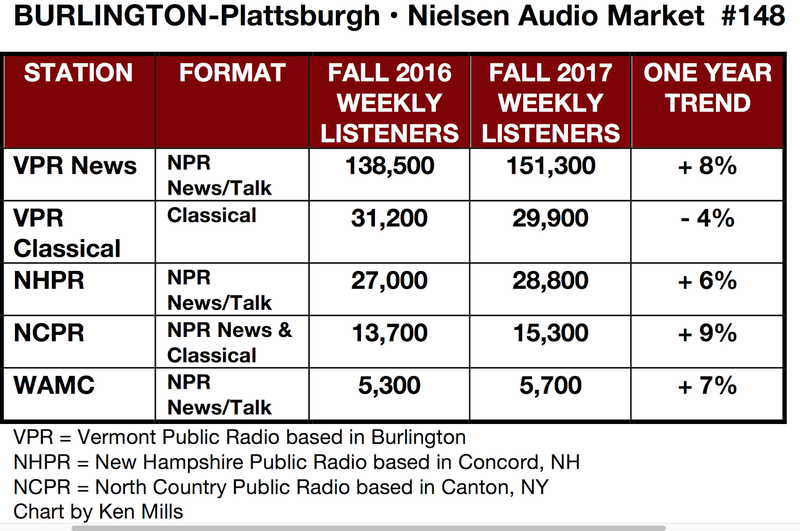 Though Burlington is a much smaller market than Madison, VPR News has far more estimated weekly listeners than WERN in Madison. WPR needs to raise their expectations. NPR News/Talk is way up in Northern Colorado. KUNC added 35% more estimated weekly listeners between Fall 2016 and Fall 2017. Triple A KJAC 105.5 The Colorado Sound was also way up in the Fort Collins-Greeley metro. These results likely made consultant Mike Henry’s day when he saw them. As you may know KUNC and KJAC have lots of listeners in the Denver-Boulder metro, just south of Fort Collins and Greeley. On the left is a composite chart that combines data for Denver-Boulder (a Nielsen PPM market) with Diary data from Fort Collins-Greely, Colorado Springs and Pueblo. Our custom analysis shows the relative size of the audiences for CPR’s stations compared to KUNC and KRCC. All of these stations are doing very, very well. We haven’t written much about Reno in the past. A couple of years ago KUNR acquired a second frequency for 24/7 Classical music. The main station, KUNR, changed to 24/7 News/Talk. Earlier we mentioned Music Discovery consultant Mike Henry. Mike designed Reno's new Triple A station KVNV NV89 [link]. It signed on last year. So far, things look good for NV89. 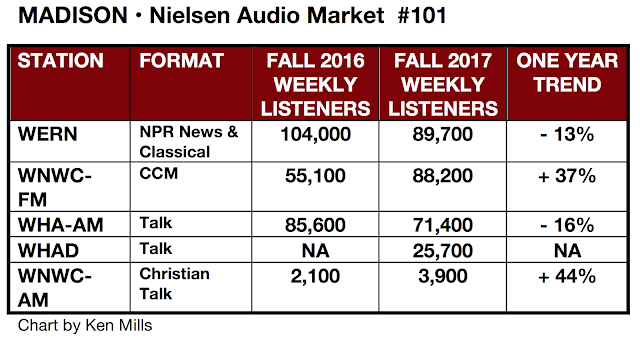 NV89's estimated weekly listeners are already challenging KUNR Classical numbers for number two noncom station in the market.